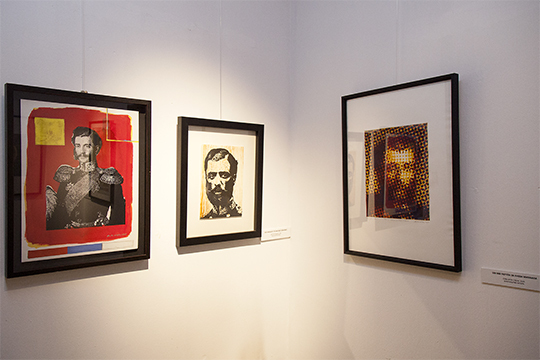 Within the frame of a new event, „Museums of Serbia, ten days from 10 a.m. to 10 p.m.”, organized by Serbia’s national museums, the exhibition „Punk visual art Portraits of the Obrenović Dynasty” was opened on Friday 13 May, in the Residence of Prince Miloš in Topčider. The exhibition has been organized under the auspices of the Ministry of Culture and Information of the Republic of Serbia. The author of the exhibition is Professor Dr. Aleksandar Leka Mladenović, who, inspired by the permanent exhibition of the Historical Museum of Serbia in the Residence of Prince Miloš, made a series of portraits of the Obrenović dynasty. The exhibited works of art are part of the programme for the modernization of the permanent display in this space, which includes occasional thematic exhibitions. Aleksandar Mladenović has applied his artistic sensibility and creative talent to portrait painting. Given the fact that „punk art” permeates the entire last decade of his work, the artist has focused his production towards personal experimentation, in which the art of portraiture and punk aesthetics exist simultaneously. With a series of portraits of family members of the Obrenović dynasty, the artist, employing different painting and graphic techniques, not only establishes a relationship with the figures of the first Serbian dynasty of modern times, but also recreates, almost two centuries later, their communication with the court in which they lived, ruled and died. Using a specific combination of collage, painting and engraving in punk style, which he inherited from his predecessors – Dada, Pop and Op-art –, the artist transforms portraits into comprehensive narratives which, by a sequence of symbols, colouristic accents, text messages and compositional solutions evoke the days of glory and days of grief of a Serbian family that was raised to dynastic heights. The artist finds similar instances in the world in which he lives, regarding which he is critical and willing to express his revolt by personal action through art and reference to the time when Serbia was fighting for her liberation and entrance among European nations, applying to his works all the elements of punk art which, as a member of the second generation of Belgrade punkers, he supported during the early 1980s. The strong fluorescent and aggressive colours, the figures intentionally left unfinished, dirt and staining strokes, letters and years symbolically selected, text messages, transform authentic figures of the dynasty members, as represented in the portraits commissioned in the 19th century as well as in original photographs of the time, into our contemporaries who, in their old home but this time on an art stage, continue to serve their people. 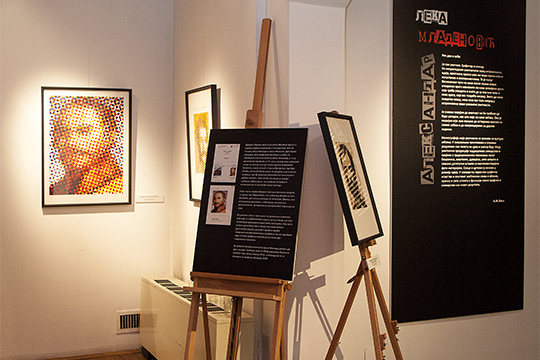 Alongside the author of the works of art Prof. Dr. Aleksandar Mladenović, the exhibition was prepared and coordinated by Tijana Jovanović Češka and Izabela Martinov Tomović, who designed the display. The exhibition is open until 31. December 2016.